Woke up to a cold, windy morning. The smell of the neighbors’ dairy farm in the air. I decided to hunt in my brother’s “cry for help” stand that morning. Many of the camp members, already departed for the week. It was a Monday, the wind was settling, the sun finally woke up to put some heat on my sculpted body. About 8:00a.m. I watched a good buck make his way methodically through the pines, the tall grass, and then into the hardwood ridge. He looked in control and on the rut prowl. He did not stop on my grunt call. At 9:15 a.m. my hunting buddy Wayne showed up, ending the morning hunt. He said he noticed many deer moving, especially on the east face of the farm. The does were being chased by the buck or bucks, but they would not show themselves. More confirmation that the rut had kicked in . Our other buddy Steve chimed in, he had only seen 17 deer. We quickly decided to relocate on another part of the farm after we completed our Camp Charming (code name for our hunting cabin) details. We would reorganize about 1:00 p.m. for the evening hunt. The 3 of us journeyed out and decided to surround the big cornfield on top of the farm. The sun was bright and the wind stopped howling. Wayne decided to hunt with a bow, because we were attempting more deer management. The bow worked for that. The stage was set. At about 5:00p.m. I noticed does mingling next to Wayne. I thought if he decided to fling an arrow at that group a lurking buck might offer pursuit. That did not happen as the buck came in from the south, obviously scenting all of those does. I looked twice and noticed it had size. I determined it was a shooter, maybe the” walk away” buck on camera in one of Doc’s early blog posts. Boom, how I like those Hornady slugs. 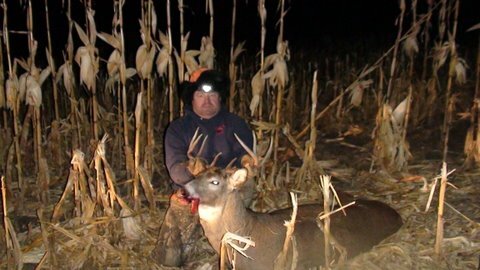 The buck immediately crashed down in the cornfield. His front shoulder shattered; it was a quick death. As I approached my kill I noticed he had suffered a little ground shrinkage, but it was definitely a shooter.